Today’s rumination on the Cubs’ need to be “creative” and the continued speculation about their limitations in payroll got me thinking about realistic impact bats available in trade. 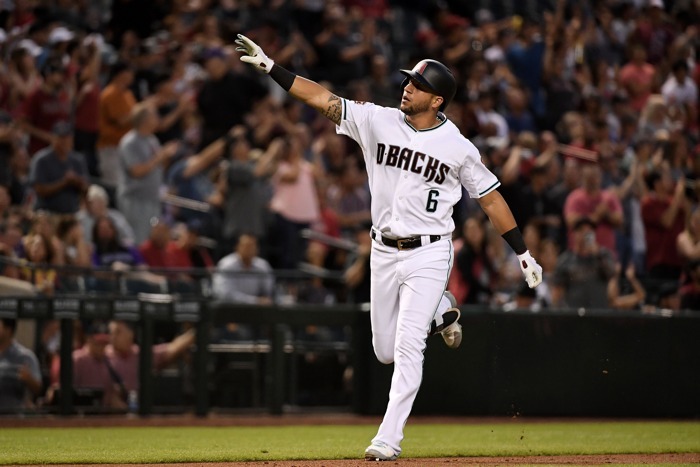 With the Diamondbacks having parted with one year of Paul Goldschmidt, perhaps they’d also be willing to deal two years of David Peralta? Peralta, 31, was a pitching prospect in the Cardinals organization many years ago when shoulder issues derailed his career. Or so it seemed, as he went on to re-invent himself as a position player in independent ball, when the Diamondbacks discovered him. He broke out 2015, but then suffered a mess of injuries in 2016, including a wrist injury that ultimately required surgery and ended his season. Although wrist injuries for hitters always make you nervous, Peralta bounced back with a slightly above-average season in the plate in 2017, and then a huge season in 2018: .293/.352/.516, 130 wRC+. His groundball rate dropped, his fly ball and line drive rates climbed, and his hard contact rate (48.6%) was the second highest in all of baseball, behind only Matt Carpenter (49.0%). He doesn’t strike out a lot, he takes his walks, and he crushes the ball while playing serviceable corner outfield defense. One downside with Peralta is that he’s always had very strong splits, raking against righties (131 wRC+ career, 150 last year) and struggling against lefties (77 career, 86 last year). He’s not quite a pure platoon player, but if you’ve got other options, there would be days when you’d sit him. In his second arbitration year in 2019, Peralta is projected by MLBTR to make just $7.7 million, and he is under team control for one more year after that. Peralta, because of his late breakout, is not that much younger (if at all) than the free agent bats out there, though he projects to be a more impactful hitter than most of them in 2019, and obviously comes on much more favorable contract terms. 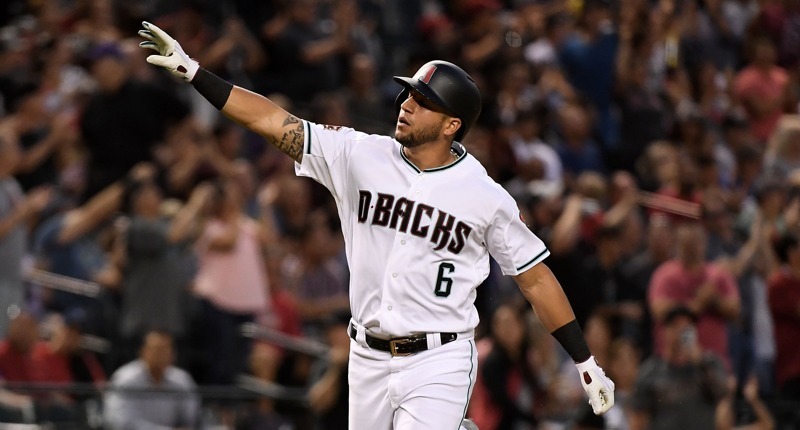 That is to say, if the Cubs believe in what Peralta did in 2018, then they might not realistically find a more impactful offensive addition out there. Acquiring Peralta would probably cost quite a bit in trade, and the Cubs would also have to commit a corner outfield spot to him. I don’t think it would be an issue to coordinate the outfielders, since all but Kyle Schwarber can also play in center field when necessary. The real issue would be the cost in trade if the Diamondbacks wanted one of those outfielders – Schwarber or Ian Happ, for example – included in the deal (and wanted more from there). Given that the Diamondbacks targeted young, big league types in the Goldschmidt deal, it wouldn’t at all be a surprise to see them to do the same for Peralta. Of course, in this tier of maneuvering, you do have to ask whether the Cubs are simply better off keeping the guys they have, with the exception of Addison Russell, and then trying to add the best value on a short-term deal at second base … if they can afford it. Then again, if the Cubs were able to include Russell in a deal with the Diamondbacks, they could come close to making it a payroll-neutral move, and then still make an addition at second base. Then again again, if you add a regular corner outfielder in Peralta AND a regular second baseman, you’re going to be sitting Ben Zobrist, Kyle Schwarber, Ian Happ, Albert Almora, and Jason Heyward an awful lot. Then again again again, they might not all still be around after all this maneuvering anyway. Then again again again, even if they are, having depth and the ability to rest and rotate is a good thing. Then again again again again, maybe you can really spice this thing up and get Archie Bradley (bullpen!) or Nick Ahmed (middle infield defense and versatility!) or John Ryan Murphy (elite framer!) in the deal and try to knock out several needs at once. So much thinking out loud. I could get lost.